PARIS (AP) — French President Emmanuel Macron appears to be clawing back support as he tries to quell the yellow vest protest movement with a national political debate. Recent polls by Ifop, BVA and Harris Interactive institutes show Macron's approval ratings rising — from 23 to 31 percent in December to 31 to 35 percent. But Macron knows the rebound could be fragile, saying recently he feels like he's "walking on ice." Macron's popularity reached its lowest level after the anti-government, yellow vest protests broke out in November —with many demonstrators calling for his resignation. The protests reached their peak in early December when the French capital was scene to rioting, shops and museums closed and graffiti was sprayed over the Arc de Triomphe monument. The fear of further violence became so acute that Macron's wife, Brigitte Macron, and some presidential aides visited the nuclear-proof bunker, the location of which remains secret, French newspaper Le Journal du Dimanche recently revealed in a report called "the ten days when Emmanuel Macron trembled." Macron has since announced a package of measures worth about 10 billion euros ($11.4 billion) to boost workers' and retirees' purchasing power and launched a "grand debate" to let ordinary French people express their views on the country's economic and democratic issues. 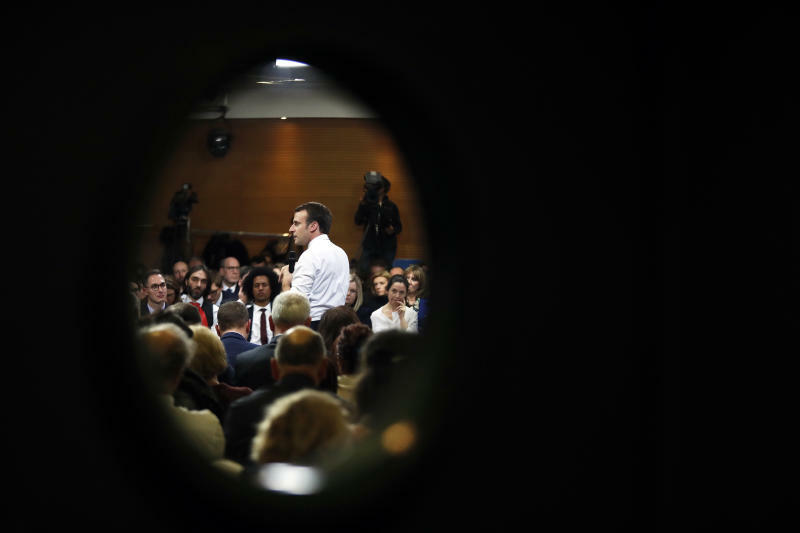 "These were first steps that enabled some people to be a bit less opposed to Macron, even if there was no enthusiasm about the measures," said Edouard Lecerf, deputy general director of the BVA polling institute. The three-month nationwide consultation launched in mid-January involves a series of meetings organized by citizens, groups and elected officials as well as an internet website where people can air their grievances. Over the last three weeks, Macron has travelled across France to take part in several debates. Rolling-up his shirt sleeves, standing in the middle of crowds of hundreds, he repeatedly answered dozens of questions for six to seven straight hours, often broadcast live on French news channels. Lecerf noted that "the grand debate now takes almost as much place as the yellow vests in the French media." He said Macron's move aims at showing political "courage and authority" and to provide a reminder of his first six months in power in 2017. Frederic Dabi, deputy director general of Ifop, said the combination of emergency measures and the grand debate "give the impression that he's back in the game, and in the context of protests he appears as a protection against instability." Macron is also meeting this week with France's main party, including Wednesday with far-left leader Jean-Luc Melenchon and head of far-right National Rally, Marine Le Pen. The French leader promised the grand debate outcomes will influence his domestic and European policies. 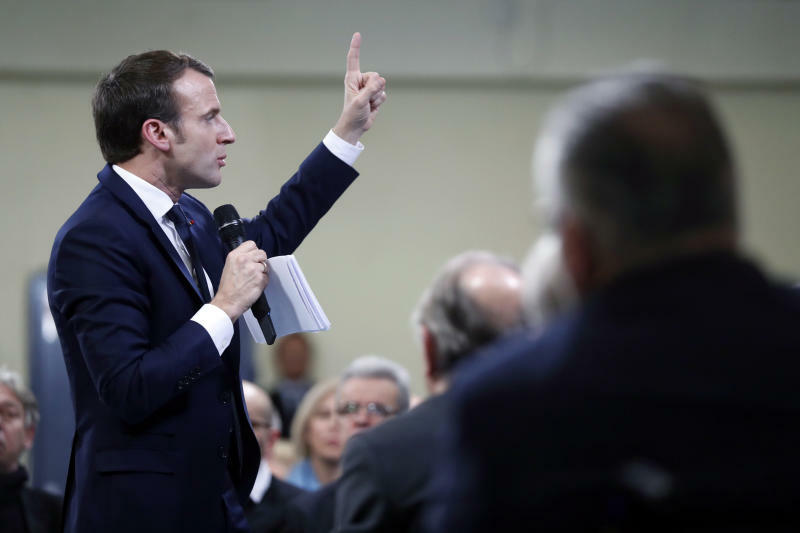 But he insisted planned reforms, including an overhaul of the indebted pension system and of France's relatively generous unemployment benefits, are maintained. 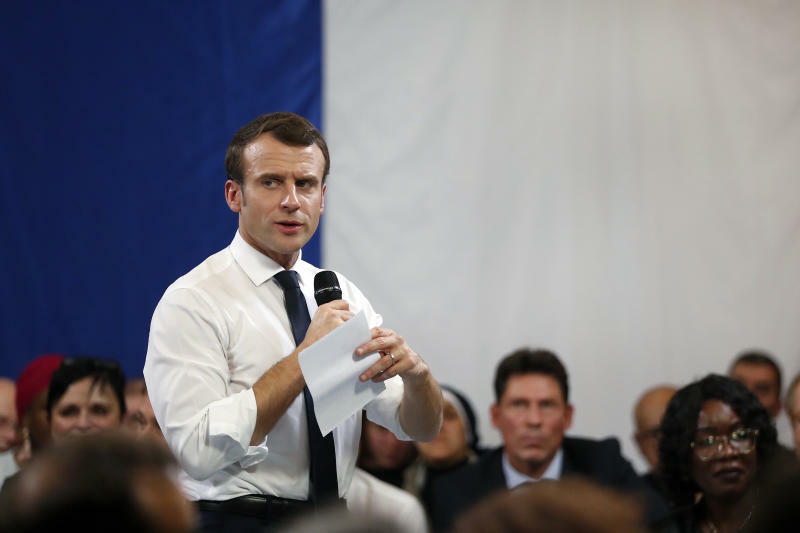 During a debate in Bourg de Peage, a small town in southeastern France, a man wearing a yellow jacket asked Macron to call new parliamentary elections. He refused, saying he "has been elected by the people." He also insisted he won't re-establish the wealth tax —one of the main demands of the yellow vests. "Two years ago with the wealth tax, did we live better? Were there less homeless people? No", he said. Pollsters stressed that the rebound in Macron's ratings remains fragile and that overall, the French leader is still very unpopular and widely perceived as arrogant. Macron has been dubbed "president of the rich" because his pro-business policies are perceived as favoring the rich. "Just a little thing could make the ice too fragile and Macron would fall down," Lecerf said.